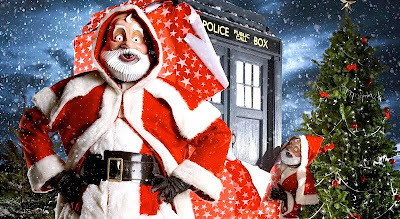 Yes, it’s that time of year and I asked Santa to bring me a few extra tools and tailoring equipment to help me in the coming year. In our household we have two present opening sessions on Christmas morning: the first is from the stockings at the end of our bed, so are small, modest gifts; followed later by the bigger presents from under the tree. So here’s my selection from the stocking. For once I am really excited about putting a garment together. Anyways, the next stage was pretty simple and straight forward, and there wasn’t really much to see as such anyways. I sewed the side seams to join the fronts to the back, and the shoulder seams to finish it off. I then sewed the sleeves and set them with a little extra ease across the shoulder to create a decent sleeve head. I then added a standard lightweight shoulder pad and some sleeve head padding just to create a good shape, but kept this to a minimum as it needs to be quite a loose fitting. This then gets the jacket to the following stage. The lapels are missing at the moment, so what you see here is the underside of the lapels with seam allowance, so they look a bit over large for now (see below). I have now designed the bulk of my Tennant Suit Pattern, and have cut the main parts in the Burgundy Pinstripe Fabric I have created. Time now to start making it up. As I do with the Tennant Coats I have made, I have found it much easier to work the panels of the garment flat, setting the pockets separately as I go, rather than trying to do them in a bulky, already made-up coat. I start with the breast pocket, repeating what I did in the Calico Test. I sew the front panel of the pocket to create the pleat which is exactly two pinstripes wide (see above, left), and press it flat. I then attach the lining along the top edge and fold it in half, making the pocket front (see above, centre). The edges are then press over and stay-stitched ready to be sewn onto the jacket (see above, right). 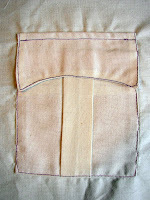 The flap above the pocket is sewn from two halves, and simply attached inverted in place and pressed firmly into its final position (see right). I then make the flaps for the faux flap pockets. To make sure they don't curl upwards after they are in place, I use a simple little trick: I put in a pin pointing towards the tips of the corners (see below, left). This pushes the top over the underside by the slightest amount and when it is sewn (leaving the pins in place) and turned rightside, this subtle distortion remains and the corners curl slightly, but in the direction I want them to (see below, right). The flap is then pressed in half to its final size (see above, right) ready to set. I do this now, because if it is pressed after it is sewn in place, it can leave a nasty footprint on the body of the jacket under the flap. The flap is then sewn in place on the jacket, inverted, at the level of the lower welt (see above, left). 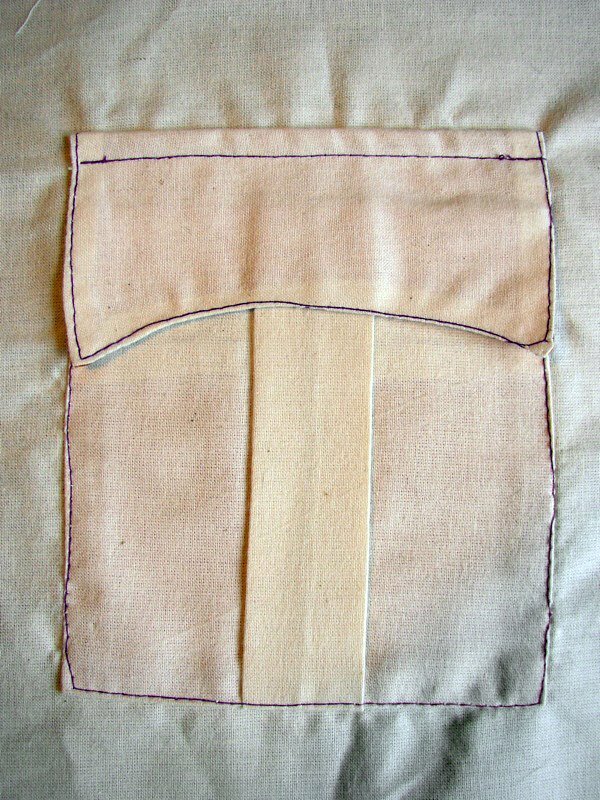 The pocket facing is then sewn above it, also inverted, and sewn at the level of the upper welt (see above, centre). The pocket opening is slit between the two welt lines (see above, right) then the pocket facing and the tail of the flap are turned to the back, making the finished pocket (see left). Today I start making my burgundy pinstripe Tennant Suit jacket. Now I KNOW it’s not a screen accurate colour - don’t write in! - I’m only doing it as a dry run before cutting into a single inch of my blue fabric. I have dyed the blue fabric to the right colour, so have dyed some red pinstriped fabric (from the same source as the blue) to a burgundy so I am comparing like-for-like material (see below). Having started (but not finished) a similar jacket earlier in the year, and a Calico Test only a couple of weeks ago, making it up should be relatively easy and quick. Before I can do any cutting I need to stiffen the fabric. It is, in reality, a shirting fabric, so quite a lightweight cotton. 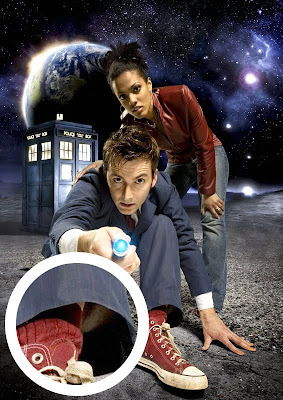 I did initally wonder if I had found the right material, but a friend pointed out that there was a publicity still where you could see the inside of the trouser ankle - and it was white, which had puzzled him (see below). This made perfect sense to me - it had been interfaced! What I needed to work out was how stiff I needed to make it. In the UK we have a main manufacteurer for interfacing, Vilene. Their basic range is a Light-weight, a Medium-weight and a Heavy-weight version. This determines the thickness. Each then comes in either a Standard or Ultrasoft option. This controls it’s flexibility. Since the fronts of jackets are usually interfaced, I am going for a Medium Stanard for the body, but I want the sleeves to be more supple, so I will use a Medium Ultrasoft for the arms. Usually you would cut the fabric then cut matching shaped interfacing and press them together. But since I need to interface everything I am going to press it first, then cut the pre-interfaced pieces after. Annoyingly the fabric and the interfacing come in different widths, so I do a strip of the fabric and save the off-cut for later. These off-cuts, once interfaced with the Ultrasoft, will be fine for the sleeves, so nothings really going to waste. So - I am gearing up to finalising the pattern for my Tennant Suit’s jacket, and yet again I am in the annoying position where I have the perfect material to use, but only a very limited supply with no chance of replenishment! Some readers may remember the mad scrabble for the JoAnn Brown Pinstripe Fabric a couple of years back, when it was discovered after it had been discontinued and only short end rolls remained in a handful of stores scattered across the US. This time I have a few metres of the Blue Pinstripe Fabric, which I am still 99.99% sure is the material used to make he original suits. But although I have cut a very respectable pattern for my jacket (see above), I want to produce a dry run on similar fabric before cutting a single inch of my precious blue material. A recent thread on the forums entitled “Which is better? Brown suit or Blue??? ?” got people talking about which suit they preferred: the brown or the blue. 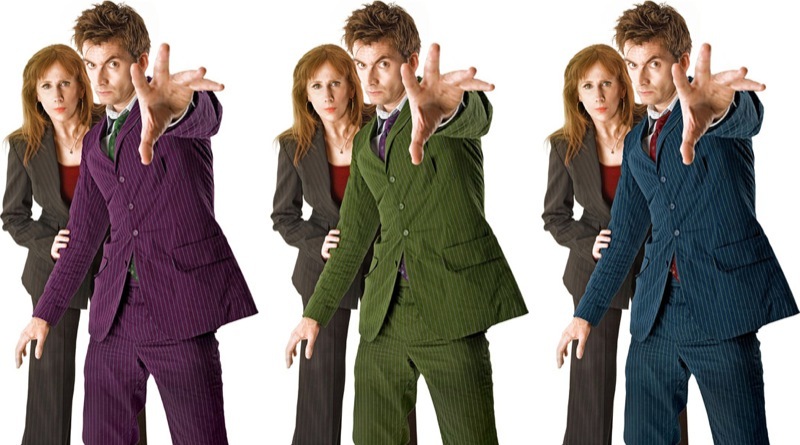 One poster, jjlehay, bucked the trend by letting his mind wander onto what other suits The Doctor may have worn if he had remained for further seasons. So far work on the new pattern for my suit has gone very well, far exceeding my expectation of how quickly and well I could cut it to fit. The Five Coat pattern I cut, although I am totally happy with it, took a while to arrive at, doing through a process of cutting - adapting - cutting - revising - cutting - altering . . . . . before I got to something I was pleased with. This time round I have cut a block (a base template) from which I then cut my pattern, both of which fitted perfectly first time (see above). 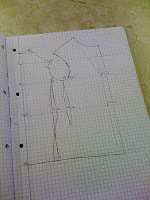 So it is now time to cut the pattern for some of the details of the suit, such as the breast and outer pockets. I had previously tackled the Breast Pocket before, and had made some decent, but crude samples (see left), so I know the the construction of the pocket already. I do, however need to work it to the new pinstripe dimensions I have. This time round though, my style will be a lot better and my work a not neater! 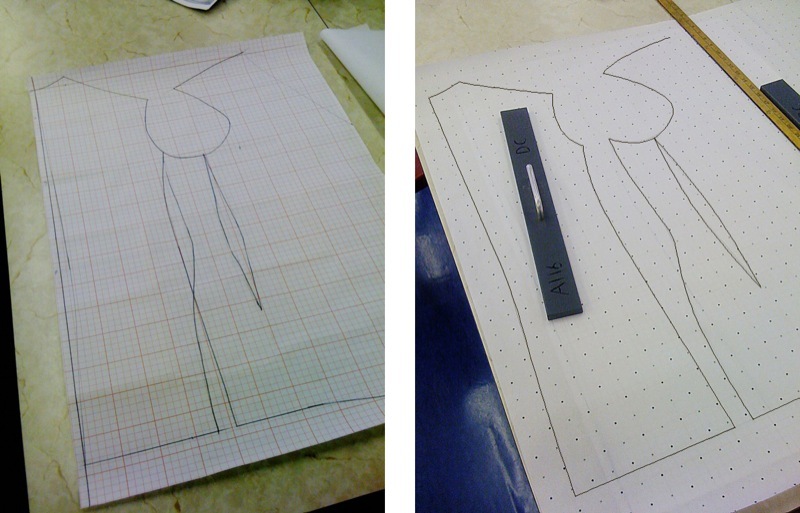 The new techniques I have learnt from my tailoring classes have shown me the best, methodical approach to use, so I first draw up the pocket as a block (see above), to the finished cut size, then trace a pattern, adding seam allowances only at that stage (see right). The pocket is made from a front, which is pleat fronted; a lining, which is just the width of the finished pocket; and the flap, which is cut in two parts. First I make the front by sewing the pleat together, and pressing flat. The lining is then attached to the top edge of the pocket, and it is folded flat, with a one-inch turnover of the front into the inside of the pocket. I then stay-stitch around the pocket to keep the edges stable (see left). Last time I had created the block for my standard jacket that would fit me, and now I need to create a working pattern from it, that I can then use to make my suit. For the moment, I am going to concentrate on the front, so am repeating the back from my basic jacket (see below, left). The front needs to be done in two parts, splitting it at the fitting dart at the side. This creates a narrow side panel (see below, centre) and the front panel (see below, right). 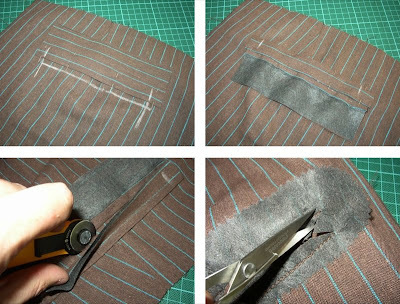 Being a pinstriped suit, it is critical how the design aligns to the pattern. I have therefore actually drawn the pinstripes onto the calico, using a swatch of the fabric as a ruler (see left). 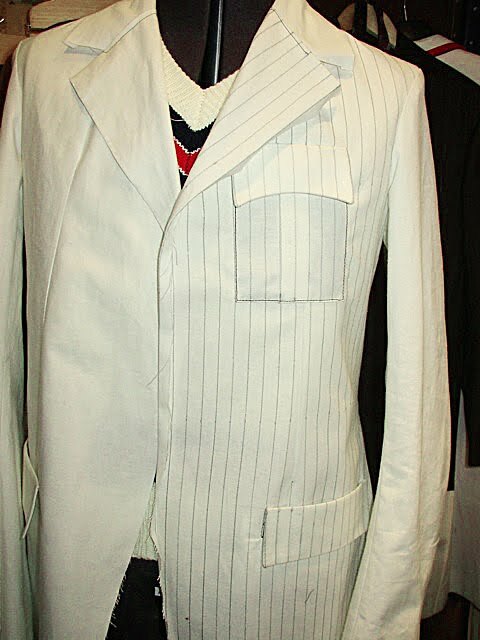 Many of the spacings for the pocket positions, the size of the pocket and flaps, width of the lapels etc can be measured by counting their sizes in spans of pinstripes. Firstly, the size and position of the breast pocket. This has a pleat three pinstripes wide, with four visible pinstripes either side. I can then measure how high it is in pinstripes on my reference photo, and translate that to a real-life measurement working to the blue fabric. For its position, I can see its base is in alignment with the second button down, and is set five pinstripes in from the edge. I incorporate this into the pattern (see below). 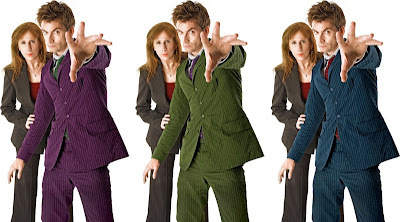 I’m getting a slight feelings of dejvue here, but having found the perfect blue fabric for a Tennant Suit AND with the new skills I have been picking up at college, I think it is time for me to start over on my suit pattern. 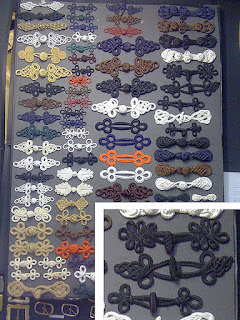 To quickly recap, at my college course I have learnt about cutting a Block – a master pattern designed to fit me, from which a majority of patterns to any style can be derived. 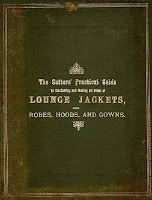 Instead of cutting a modern Block, I opted for one based on notes contained in The Cutter’s Guide to Lounge Jackets, (see right) a manual written for the tailors of the 1890s to use for making the latest fashions. 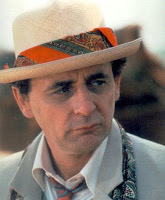 This was perfect for me to use, as a lot of The Doctor’s costumes are turn of the century or Georgian in styling. I followed the guide to plot out the basic shape, using my measurements, firstly at a quarter-scale to gain an understanding of how it is drawn up (see left), then later at full size (see below). This was then traced to make a basic pattern, and subsequently a twill, or calico test. Putting it on for the first time exceeded expectation as it fitted perfectly, and my tutor remarked that it needed little or no revision for it to be usable. That stands as good testament to The Cutter’s Guide as a good source of material! After the excitement of finding what I believe is the fabric used to make the blue suit, I now need to work out how to over-dye it to match it to the screen-used fabric. I am using a standard machine washing Dylon dye, in the same way I did when I needed to dye the pillow ticking for the Six Trousers I made earlier this year. First thing you do is put 500g of table salt in the drum of the washing machine (see below, left), before adding the dye (see below, centre). I then adds the fabric (see below, right), put the machine on for a 40 degree wash and cross my fingers!!! This is the un-dyed fabric to see how it started out. My first attempt used a mid-colour blue dye, which although it gave a good result, and toned down the bright red pinstripes to somewhere near the correct shade of dark red. However, it is a bit too electric and vibrant. The next thing I tried was to move to a different shade of blue, tis time using a dye akin to blue denim. However, this come out shockingly dark, and the pinstripes are almost completely lost. You can just see them in the inset, if you click to enlarge. Having failed dismally with the latest attempt, I returned to the colour I used for the first version. Looking at it I realised that although it was too vivid, it was the right colour, but needed to be toned down. I could do this by using less dye or more fabric, but this would make the resulting colour lighter, and that is not what is needed. Now I am back working on my Tennant Suit, a series of happy coincidences arrived at an amazing discovery. I had recently finished a pair of Season 19 Five Trousers for a client, and with a lot of uncertainly over postal strikes in the UK, I was reluctant to post them to him fearing they may become part of the mountains of undelivered mail that have been collecting in sorting depots over the preceding few weeks. Luckily my client only lived the other side of London, and given he had an interest in the fabric sellers based in Soho, we decided the best thing to do was meet up for a joint trip around the shops and to hand over the trousers in person. Irritatingly a combination of freelance work placements and my need to attend college in Hemel Hempstead prevented us from meet as soon as we had hoped, so credit must go to my client’s patience while we waited for a mutually convenient day to happen, and today (16th October) was finally that day! We meet just after lunch in a Starbucks on Wardour Street and had a good chat about Who costumes before setting out on our tour. First stop was Kliens (see left), where I needed some 4-Part Hook and Eye Trouser Fastenings for another pair of Five Trousers I was working on. Kliens is a great little shop for hard to find professional quality haberdashery. 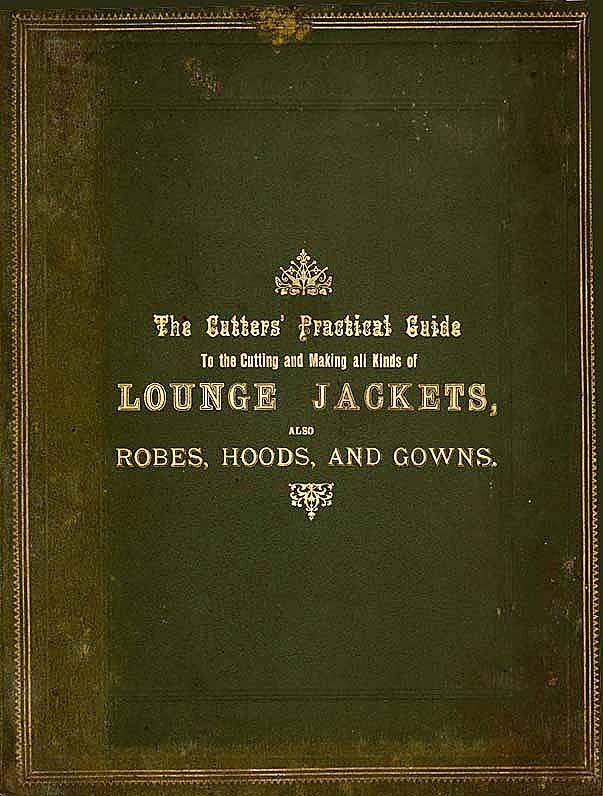 Knowing I have a reliable source of these makes creating these garments all the more tempting, and as you may have read, I plan to do so in my Tailoring Class in the near future. We carried on our journey, taking in a number of shops, with a shortlist of fabrics we wanted to try and track down, such as the houndstooth check used for Tom Baker’s waistcoat (see below, left); various velvets and tartans for Jon Pertwee’s costume (see below, centre); we well as the elusive beige fabric for the Five Coat I am also working on right now (see below, right). As you may have been reading over on my Five Costume Blog, I have been attending a College Course to learn some tailoring skills and improve my work quality. My plan is to apply these skills to a variety of projects including an Inverness Cape over on my new Three Costume Blog. 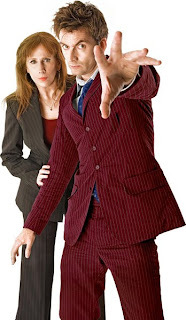 I also intend to use the course to help kick-start my Tennant Suit work, which has rather lapsed of late. The last work I did on the suit jacket was way back in May 2009, when I cracked the Faux Flap Pockets. (see right). That work is still valid, as too is the design I did for the Box-Pleat Breast Pocket I had done earlier (see below). However, the one thing I was having issues with was the body shape of the jacket itself. Being self-taught has got me a long way, but doing a fitted jacket was proving to be challenge that was stretching my skill too far. My plan is to gain the knowledge I need form the course to rectify this and crack making fitted jackets! I discussed this with my tutor, Nicola, and she explained that I needed to first create a ‘block’ for my jacket. A block is a term used for a non-pattern specific shape used for fitting, from which usable patterns can be easily derived. She explanied to me the best way to arrive at my block. Firstly, we need to draw everything in pencil at quarter-scale. From there we make up, again at quarter-scale, a thin cardboard three-dimensional test which checks it all meets up at the seams correctly. Once that is done, I can then work to full size to check sizing and fit. 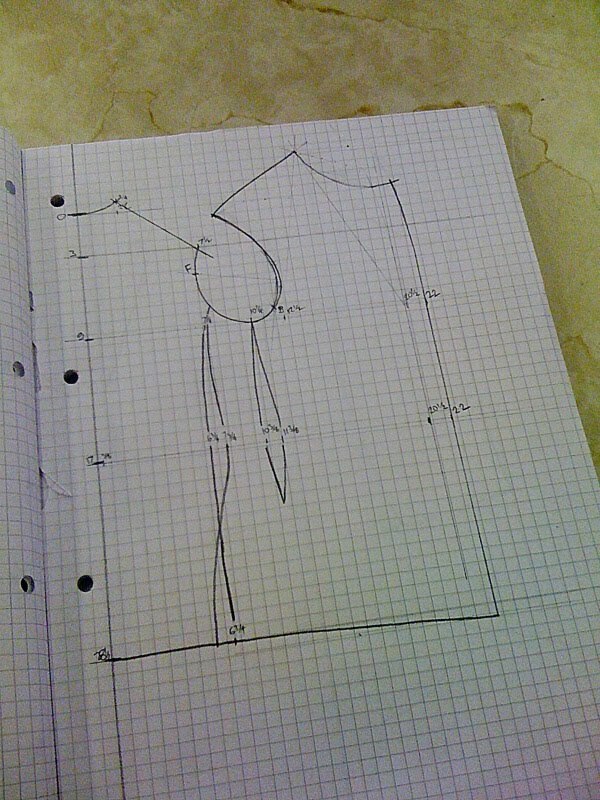 Finally, we can plot the position of the seams for a given jacket style to cut the pattern I need. 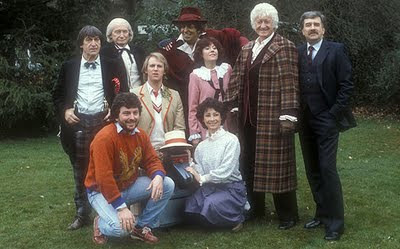 Recently I have had a number of enquires about the trousers I have been making based on the classic series costumes. I have therefore decided to make them available for commission. If you are interested, please get in touch by emailing me at tennantcoat@me.com. 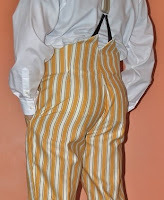 Screen accurate copy of trousers as worn by Peter Davison in his first two seasons. Fabric is bespoke printed by Spoonflower and has been designed to accurately match genuine garment. Although never seen in full on screen, pattern has been based as closely as possible to the trousers as seen in Planet Of Fire. Trousers have high V-split back; zip and hook & eye fastenings; two side pockets; buttons ready for braces (braces not supplied! ); lined from waistband to pockets. Made to a pattern to match the trousers seen in Planet of Fire, these trousers are made with a fabric design not previously made available. This design of trouser was also seen recently in Time Crash, where Peter Davison wore the pair that had been let out for Colin Baker during the regeneration scene in Caves Of Androzani. Made from authentic woven pillow ticking and dyed to just the right colour as described in Making Phoenix Fabric. NB: trousers shown are made directly from the California Pants pattern and are not strictly screen accurate. Trousers made will be to a revised screen accurate pattern. 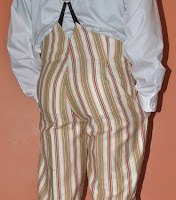 Trousers have zip and hook & eye fastening; two side and two back pockets; buttons ready for braces (braces not supplied! ); lined from waistband to pockets. TERMS AND CONDITIONS: All trousers are made-to-measure to dimensions supplied by buyer. If mutually agreed, a calico test to check fit is available at £20. Payment of 50% deposit on commission, balance due within one week of completion of garment, and once cleared, items will be shipped. Payment by PayPal preferred, or if in UK, cheque is acceptable. Shipping within UK is free by recorded delivery, outside UK items will be sent FedEx, payable by buyer. No liability can be taken for incorrectly taken measurements supplied by buyer, but all efforts will be made to ensure your complete satisfaction with your order. Having successfully finished the fronts of the trousers, it’s time to turn attention to the backs. First thing I need to do is put some reinforcing interface around the areas that will be sewn. These are around the back pockets and a small fitting dart that goes between the pockets and the waistband. Looking closely at the GAP trousers I find they did this in one piece, so I copy the shape and cut my interface in a similar way (see right). Because the interface does not cover the entire area of the fabric I am stiffening, the edges are cut with pinking shears to avoid a line being visible from the right-side of the finished trousers. I then iron the interfacing in place and sew the darts (see above left). I don’t bother to trim the seam allowance of the darts because they are so small and it may only weaken the trousers. I press the darts flat from the right-side (see above right). I am now ready to do the back welted pockets. Setting welted pockets like these has become a regular thing for me, but this time I need pay a little more attention to detail; the welts are a little finer; the pinstripes means cutting needs to be more precise; and because the trousers are not fully lined, the pocket bags will be exposed and will need to be much neater and have no exposed raw edges. I have extensively covered welted pockets before when I was making my Calico Tennant Coat, the Alcantara Tennant Coat and Six Trousers, so I will skim over a few things and try to focus on only the unique aspects of these pockets in this entry. The pieces I prepare are two interfaced welts, folded and pressed in half; one interfaced pocket facing; and a button loop made from pinstripe fabric (see left). I have carefully cut and pressed these so pinstripes will be visible on each. I then mark the position of the pocket (see below left) and sew the welts on the right-side, flipped upside-down (see below right). I then cut between the two welts (see above left) and snip to the ends of the stitching in a Y shape at each end (see above right).